The Hiroshima Peace Memorial (Genbaku Dome) is a symbol of world peace after the destruction created by the first atom bomb. The building, a former industrial promotion site, was the only one left standing near the centre of the explosion. The US and China had their doubts about the inscription. The representative of the US spoke of a : "... lack of historical perspective, and protested against this and future inscription of war sites." His Chinese colleague stated that: "it was the other Asian countries and peoples who suffered the greatest loss in life and property during World War II, and that this inscription might be misused by people who deny this fact." The park that now surrounds this monument has various other smaller monuments, to honor special groups of victims. There is also a museum where you can see the effects of the bomb on humans and artefacts. The museum in the Park tells the story about the bomb on Hiroshima, but also about all the nuclear tests that were executed after that. I found this, and the rest of the Park, very impressive and tasteful. Hiroshima itself is of course a very modern city, but I liked it a lot. It has a lot to offer, for example ... another Worldheritage! The Itsukushima Shrine is situated on an island in front of Hiroshima-City. Summer of 2011, I made my first trip to Japan. My arrival was in Kansai. I have always wanted to visit four Japanese cities since my collegiate years: Kyoto, Nara, Nikko, and Hiroshima. On my first trip to Japan, I decided to see Hiroshima first. To date, the city prides two UNESCO World Heritage Sites: Itsukushima Shinto Shrine (popularly known as Miyajima) and the Genbaku Dome (Hiroshima Peace Memorial). This post is about the latter. 6 August 1945 changed Japan and the world - the first atomic bomb was dropped at Hiroshima killing almost 300,000 and continued the suffering of many others in the city. The detonation also marked the end of World War II. A few meters away from the hypocenter (ground zero in the English-world context) is the Genbuku Dome or the Atomic Bomb Dome, which despite its location avoided a complete destruction. The remains of the building still stand today. 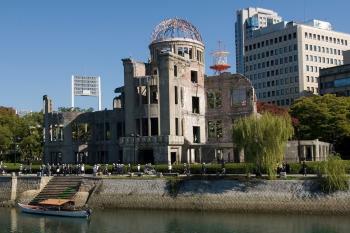 Hiroshima decided to keep the ruins as a reminder of the senselessness of war. The memorial was inscribed a World Heritage Site in 1996 with the entire complex its buffer zone, which for the Japanese a symbol of the true value of peace. At the time of the detonation, the building was the Hiroshima Prefectural Industrial Promotion Hall. The blast exerted about 35 tons of pressure per square meter and created a fierce wind speed of 440 meters per second. According to visithiroshima.net, “the building absorbed the powerful explosion and heat and burst into flames. Because the impact of the blast came almost directly overhead, curiously the thick outer walls and the steel dome escaped complete destruction.” Nonetheless, the impact and radiation from Little Boy (the atomic bomb) killed instantaneously the people inside the building. The hall’s interior was completely gutted. The inscription process was controversial. Representatives of State Parties from China and the United States found the nomination unsatisfactory. China, for instance, cited that the monument could be used to downplay the aggressive role of Japan during World War II. The United States, on the other hand, was convinced that having a memorial to a war site might throw away the necessary historical contexts of the Pacific War/World War II. In the end, the United States dissociated itself from the election process. Today, Hiroshima remains a reminder that war and absurdity are ontologically linked. With the inscription of The Hiroshima Peace Memorial (Genbaku Dome) as a WHS, Hiroshima has become synonymous with peace. For a longer commentary on the Genbaku Dome, click here. Read more from S. Anril Tiatco here. I visited this site in 2007. This is one of the more somber world heritage sites you can visit, along with Auschwitz. In addition to the park, I would also suggest visiting the museum which tells the history of the dropping of the atomic bomb and its aftermath in the city of Hiroshima. While in Hiroshima, it is easy to visit the nearby Itsukushima Shrine. 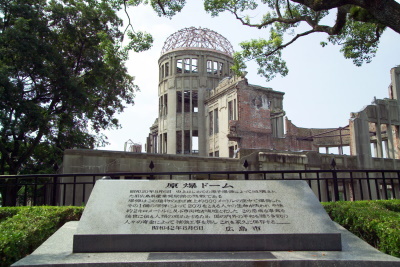 Read more about the Hiroshima Peace Memorial (Genbaku Dome) on my website. Until Bikini Atoll's inscription in 2010, Genbaku Dome is the only World Heritage Site relating to nuclear technology which many people consider a new page of human history making this site to be one of the most unique on the list of UNESCO. My review will focus only for its physical appearance and try not to mention the WWII matters. Genbaku Dome is a ruined building in the centre of the city of Hiroshima and is a part of the much bigger Hiroshima Peace Memorial Park. The building is designed by a Czech architect, Jan Letzel, whose works mainly located in Japan and tragically most of them destroyed by earthquake and war, as a commercial exhibition hall, despite the destruction; many Art Nouveau and classical motifs of the building are still visible. Its iconic ruined dome and building have steel frame supporting to prevent the possible collapse. It is a common misunderstanding that Genbaku Dome is the single building that survived the atomic bombs as many website claimed. In fact many concrete buildings in the town center are survived the bomb, and actually the small tourist center which located next to the bridge inside the Peace Memorial Park is one of them but no one seem to pay attention! Most of those buildings have been renovated after WWII, only the Genbaku Dome that has been preserved in its ruined state as the memorial. Another misunderstanding is that the dome is the hypocenter; the actual hypocenter is the nearby hospital or a medical clinic at that moment. On the opposite side of the river is another part of Hiroshima Peace Memorial Park where the Peace Museum, the Cenotaph, and the Peace Flame located. I have to say I really admired the landscape design of the park for its simplicity but elegant in the same time which quite different from the one in Nagasaki. The Peace Museum building designed by Kenzo Tange is a real masterpiece and looked pretty amazing especially at twilight. I also love the way that the Genbaku Dome, the rose bushes, the Peace Frame, the Cenotaph and Museum are located in the same axis line which make the whole park integrated with all elements of symbolic meaning. The Genbaku Dome at night is another surprise, the solemn red light that lid inside the building really similar to burning from Atomic bomb. Genbaku Dome truly is a significant site for human history as the first wartime use of atomic bomb and should be seen. The place existence is maybe controversial for historical debate, but the lesson I learned after visiting this place and seem to me that Hiroshima and her people also want to convey the message from their city which rises again from the ashes of destruction like phoenix bird is whatever happens life has to go on. I visited this WHS in November 2009. The A-Dome is the only standing building that was left after the Atomic bomb explosion. It is a powerful symbol of the destruction mankind can bring about but also a symbol of hope and world peace. The Peace Memorial Park and Centre is deeply touching and an important life experience. I visited this site on a lovely Sunday afternoon in October 2008. Yes it has taken me this long to make the decision to write this review. I must state from the outset that I have never experienced the terrible war. But I was born in a country that was invaded and occupied by the Japanese for more than 3 years. My parents and grandparents suffered during these 3 years. I believe my grandfather lost a cousin because the Japanese thought that he might have been some anti-Japanese element. I can't say that I'm angry with anyone over the war. After all the war is to me merely something I hear about from people who survived it or read about in books. But walking through that park that afternoon, I couldn't help but think about all the multitudes of people in various countries who had suffered tremendously because of the Japanese invasion and who are still in pain today. At the same time, to be very honest, I could not help but wonder what I would have become if that bomb had not been dropped. I see the dome as a reminder not only that the world must work hard for peace but that people must respect other people too despite their differences. War is simply not right. Having said that, I got quite a kick from seeing a copy of the history textbook I had studied from being exhibited in that section on what other countries say about the war at the museum. I am currently living in Japan and was able to visit the Genbaku Dome on a trip to Hiroshima and Miyajima this past weekend. I was very glad to go as it is a place that evokes a lot of thought. The thing that made me smile the most was a young woman sitting on the steps on the other side of the river with her guitar and singing her heart out. It gave me a feeling of hope that even at a place where the effect of war is so obvious you can see life continuing to move on. I would recommend going to the Genbaku Dome and memorial part to anyone who has the chance. The museum on the site is also filled with many interesting artifacts from the time. Make sure you do your research about the the events that led up to the bombing of Hiroshima and Nagasaki before you go to the museum. There is a lot of very informative information about the building and growing of Hiroshima from its humble beginnings to being used as a port full of factories for the war effort, but the information becomes more and more biased as the history presented gets closer to the dates of the bombings. I was at Hiroshima in early 1952. I had gone to a supply specialist school on Eta Jima and had taken the ferry to Hiroshima on 3 different weekends. I have many pictures and remembrances of these trips. One I especially remember is a man coming up to me on the main street, turning around and showing me his back that was horribly burnt. He then turned back to me and showed me an old LIFE magazine photo of him with burnt skin hanging in shreds. Then, he handed me a card which read "K. K. Kikura - Number One Atom Bomb Sufferer" and wanted to sell me an autographed card. A friend of mine who was second in command of the Lawrence Livermore Laboratory, under Dr. Teller, told me that I may have gotten enough radiation in those all day visits to make it impossible for me to have children and we finally after 10 years of marriage, adopted a boy who is now 40 years old. As an Army brat (living in Kobe, Japan, 1950-52, and attending Osaka American High school) we went on a basket ball trip to Eta Jima. On returning we stopped at Hiroshima for a 2 hour lay-over and visited the A-site (the Genbaku Dome) which was in total rubble at its base and some of the structure still remaining. The remainder of the city appeared level except for a few make-shift shacks standing. I met an elderly (in his late 30s or early 40's) Japanese gentleman who spoke and wrote perfect English by the name of Rev. S.T. Katsuki (this is 1951) who stated he was the Chief Priest of Sairenji Temple. He presented me with one of the ceramic tiles from this building revealing the blast discoloration from the bomb on the exposed portion of the tile, totally black. I still have this Atomic exposed tile in my possession. He then took off his shirt and showed me his back which was all in scared tissue. Because of the radiation, his time was limited. I'm able to send a photo of the Atomic struck tile by internet to those interested. While working for Nitto Denko America (Japanese Semiconductor Molding Compound Manufacture) in 1986, I had the privilege of visiting Nagasaki's Atomic bomb site. In 1953, while attending Northern Arizona University, a group of us drove to Nevada and observed an Atomic bomb explosion. We were 24 miles from the explosion site and felt the blast of wind. As an analytical chemist in 1958 at Tuba City, Arizona I analyzed uranium ore from the Grand Canyon for process control in the production of "yello-cake". Now I'm wondering what's my next trip with the ATOM. The Peace Dome Building was built by a Eastern Europian in 1915 & served as a industrial & promotional hall. And it survived the wrath of The Big Blast. Today it serves a reminder of what happens when you mess with the wrong group. Some say there wouldn't have been Hiroshima if there wasn't a Pearl Harbor & for some it's Even Steven at it's best. However I do like to see in person and photograph the building in every angle & also photograph the model before August 6, 1945. It's a impressive building. By the way, my birthdate is August 6, 1955. I visted the Hiroshima Peace Park in May 2008. The A-Bomb dome itself is an incredible building, thinking back to those days and what happened at the site makes you really think about how we treat each other. The Museum itself casts no accusations, gives no blame, it just states the facts while I feel if the situation was reversed I think some in the west might struggle to do especially when you consider the reason given for dropping the bomb on Japan rather than Germany (if the bomb failed Germany might be able to reverse engineer it, Japan would not) I spent an entire day in the park and it didn't feel like enough time. From the man collecting the paper cranes every day at Sadako Suzaki's memorial to the line that runs from the middle of the Museum, past the Peace Memorial to the A-Bomb dome this really is a place that makes you think about life. I can't recommend it highly enough not as a place to go and gawp, but a place to go and really think. I whent to Genbaku dome & the Peace park when i was 9, we were on a family holiday, the experance opend my eyes on the whole wars thing. While i was there i lernt to make papper crains, and when i got home i tried to teach my class how to make them so we could make a thousand paper crains to send to the peace park!! I'm still working on it 3 years later!! I'm doing a goeography assiment about world herriage sites & i chose Hiroshima Peace Minorial (Genbaku Dome) for it, having witnessed it & all the suffering. Go to the Hiroshima Peace Memorial Park with an open mind and witness the destructive power unleashed at the dawn of the nuclear age. Remember that the world is now a perilous place with nuclear weapons a hundred fold more powerful than the bombs dropped on Hiroshima and Nagasaki. My 13 year old daughter and I visited Genbaku Dome and the Park on 8/6/08 and left with a sense of foreboding and also one of hope; sadness at the thought of the many children who perished; wonder and amazement of the people of Hiroshima who have transformed this city in a little over two generations. For many from all the nations involved, the war will never be completely over for the pain is great. But it is up to us, the generation of the here and now, to forgive and to make sure this kind of war never happens again. I returned from Hiroshima yesterday (6th august 2006). It was my childhood dream to see Hiroshima cos' we had a topic about Hiroshima in our text book .Gembaku dome's photo was there too . They only thing that had created deep impact in my mind when I was a elementary school student is that ,America dropped atomic bomb on that city and killed most of the people . After so many years ,when I visited the A-bomb dome and the peace memorial park , I couldn't stop crying . Seeing all those artifacts ,I only thought that how cruel the decision makers were !! I saw couple of American's there too .I was trying to see their facial expression ,are they seem to be repentent or ashamed for their forefather's cruel decision ? To stop war immediately by killing thousands of people was not a good idea indeed . Another thing knocked me that was Japan hides its brutality ,it never says what they do to their neighbours . The museum told about Japanese citizens who were killed by A-bomb .The museum's history has little or no place for the Korean slaves who were forced to come to Japan . The museum didn't tell the whole history rather than a part that is looking for sympathy .Yes ,surely it can melt somebody like me who's memory consisted of only one picture .But truth should be revealed ,history should be completed . 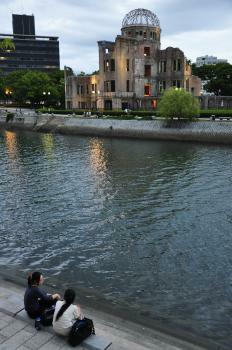 I`ve been to the Hiroshima Peace Memorial a couple of times before in my life. What I noticed was that war isn`t the answer. It won`t do anything but harm the innocent ones. Of course, Japan was not fair but the bomb the American`s dropped was unimaginative and it had brought destruction. I`m a Japanese-American and I love and support both Japan and America very much. I`m very happy that now, we have friendship and trust. I`m twelve and I`ve only been to the Peace Memorial when I was little so I hope to go this year to find more about it. Hiroshima is one of the most evocative places I have ever visited. The hardest thing with Hiroshima is separating right and wrong. At times, the museum glosses over Japan crimes in WWII - as is true through-out the whole country. Whatever the other arguements the site is incredibly moving and a compelling arguement against nuclear weapons. But, I would ask all visitors to say an extra pray at the monument for the Korean victims of the bomb. These people, slave labourers transported from Korea, have been ignored by Japan for far too long - the Governments lack of apology on this matter is inexcusible. The final thing that I must add about Hiroshima is that the people of the city lift the spirit beyond belief. It is, perhaps, Japans most friendly city. Well I just returned from the city of Hiroshima the weekend of June 19-20. Beautiful city, the buildings left reminaing or a site to see as well as the "A" Dome in its original state. War is war proven through centuries of history. The dome is a reminder of what weapons of mass destruction can do yet I felt the museuem was hippocritical and looking for sympathy instead of educating. Taking facts and bending them too much and having 90 percent of the artifacts of that belonging to children. Seems that the City forgot what the country did in Nanking, Singapore, Hong Kong, Pearl Harbor, Philippines, Malaysia, Indonesia, and the list will always continue... And what it would have took to end the war in the Pacific. This place willl leave the ignorant in history take it for what it is and not what it should be. i had the chance to see the genbaku dome in the year 2000' its something interesting. the only structure leftstanding in the area where the first tomic bomb exploded on august 6,1945. It is amazing how that building has a lot of meaning to the citizens from hiroshima, it attracts people from everywere, including my country, Honduras. Controversial at inscription: Reservations expressed by China and disassociation by USA. 175 Community Members have visited.